"In or out" for Nature? The decision on whether we will stay in or leave the EU will be made in just a few days time during the referendum vote on the 23rd of June. In anything like this, people of course vote on what matters to them and how they see that things will impact them. If may come as no surprise to you, but what really matters to me is the natural world and the negative impact that the enormous "world" population is having on it. This blog is about my concerns for British wildlife, habitats and global climate change if we decide as a country to leave. To prepare for this blog I ran a poll on twitter to see how everyone else felt about the impacts of the referendum on the natural world. I asked one simple question; "Will climate change legislation and nature protection laws be stronger in or out of Europe?" The results are below. More than 200 people voted, and as you can see an overwhelming percentage feel that the natural world and environment would be better protected if we stayed in the EU. Nearly all of our environmental laws are formed and backed up at EU level. According to the RSPB, the EU Nature Directives have provided the highest level of protection to vulnerable habitats and species for the past 30 years. And although they are being reviewed, they still offer strong protection. If we decide to leave, will these laws become weaker? Weak to the point that it will be easier to get round laws/guidelines; for example climate targets, hunting laws, use of EU banned pesticides, raptor persecution, emissions etc. During the last UK elections I blogged about my disappointment in the leaders debate, about how low down the political agenda the natural world is. The trouble is that most decisions seem to be so short sighted. Take fracking for example. It's a quick fix to securing energy for a good few years, but what are the long term implications; would we still choose fracking if we were to #Think500YearsAhead. Maybe we would still have to due to all the short sighted decisions that have gone before. My fear is that if we come out of the EU, the political priorities will all be about quick, short sighted wins. And where does that leave nature directives..........right at the back of the queue. Take our bees for example. Back in July 2015 the UK government decided to suspend the EU ban on pesticides linked to serious harm in bees. Bees are essential pollinators. One out of every three bites of food we eat is made possible by a pollinator; so why even consider using a neonicotinoid pesticide linked to serious harm in bees. Fortunately this year the temporary lifting of the ban was not granted, but who knows what will happen in the future. The risks faced by our wildlife are growing every day, and the days are growing closer to the all important referendum. Our wildlife is under real pressure from building development and infrastructure, intensive farming and agriculture, also not to mention fisheries. This is not a problem the UK faces alone or in isolation. Migratory birds, insects and marine wildlife all cross borders; as does pollution. We need to tackle this together, as part of an agreed plan. The risks are ever increasing and there is real urgency for international action. All the trade and finance we seem to strive for amounts to nothing if we don't have the basic as a priority; a healthy planet. We can only achieve a healthy planet by working together across the borders. But we are leaving it way to late to make the big, often hard decisions, needed to put things right. I believe that climate change will be one of the biggest challenges faced by my generation. Climate change cannot be tackled as an individual; it needs joint plans, agreed action and a desire to do the right thing across all the borders. In or out though, one thing is for certain, we all need to step up a gear in protecting our natural inheritance. We all need to #Think500YearsAhead. Hen Harrier Day 2016 is fast approaching. Events are taking place all across the country again this year as more and more people become aware of the plight of our Hen Harriers. Sometimes a number doesn't really mean anything, but when you can see a solid list of people that want to make a difference, I think that then you really start to see the growing strength and power for change that we can make. To demonstrate the number of growing supporters, I am building an unofficial list/register of all the people and organisations that are proud to show their support. Is This The Year We Say Goodbye? "The Hen Harrier goes extinct as a breeding birding in England." Imagine waking up to that headline. How would that make you feel? Would you feel angry? Would you feel a sense of loss? Would you feel guilty that you didn't try and do more to save them? I would feel all those things, but I would also feel cheated; cheated that one more species from my natural inheritance has been allowed to disappear. And do you know what, I think that this year will be the one where we wake up to that headline. RSPB's Martin Harper today published a blog giving an update on this year's breeding season, and it does not make good reading. According to Martin's blog there have been "only a tiny handful of nesting attempts to date" and no confirmation of any successful breeding pairs in England. The weather and low vole numbers would not have had the serious impact they are having if we had a healthy number of hen harriers to start with. I find the hen harrier situation one of the most frustrating conservation challenges. The breeding habitat is there, but the on-going persecution of raptors by a small minority has brought us to this point. There are some people that think they are above the law and the evidence is clear to see; shot, poisoned and trapped raptors across the uplands. I have written before about the first time I ever saw a hen harrier. It was a stunning male in North Wales. It was a misty morning high up in the moors. My eyes were adjusting to the grey scale colours when this ghostly bird soared effortlessly out through mist and I swear our eyes met for a moment. As quickly as it appeared, it blended back into the moorland; and from that moment I was hooked. Why should moments like that be taken away from us? Why should someone else, with their finger on a trigger, decide whether or not we get to see sky dancers soaring over the moors. So are you angry? Have you had enough? Well then you need to do something. You need to stand up and say that you are not prepared to let such an iconic bird go extinct in our lifetime. It is now 2 years since I made Harry to raise awareness about the plight of the hen harrier, but sadly I am watching the situation go from bad to worse, despite all the efforts of so many dedicated people. But you can't give up, you have to talk more and more about what is happening. You have to all pull together and speak up together. So please, please tell everyone you know about the plight of the hen harrier and come together at one of the forthcoming Hen Harrier Days taking place across the country. Talk to the people you know there and more importantly talk to the people you don't know. Find out as much information as you can and decide how you want to help going forwards. 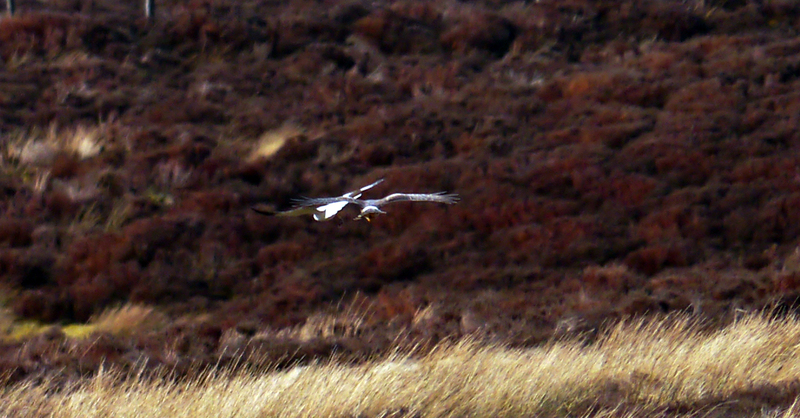 I have learnt so much more about hen harriers and raptor persecution over the last 2 years. I will be at RSPB Rainham on Saturday 6th August and I will be giving a talk at the Peak District event on 7th August. Don't be one of the people that thinks "I wish I'd done more".